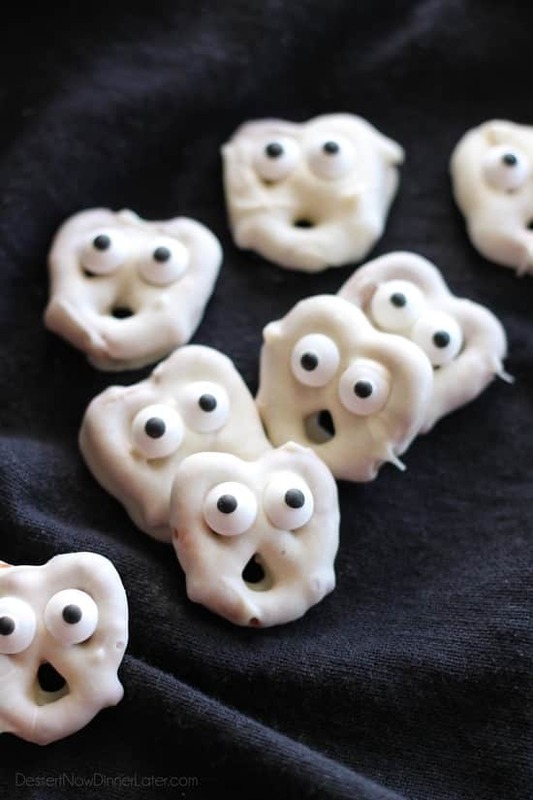 Ghost Pretzels (+ Video) - Dessert Now, Dinner Later! 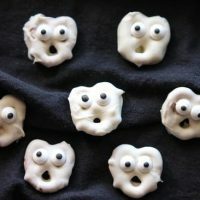 Ghost Pretzels – White chocolate dipped pretzels are made into ghosts with candy eyes and a little bit of imagination. I love how my kids are giddy about the simplest things. I do a little something fun, and they think I’m the coolest mom EVER. 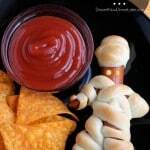 These ghost pretzels were a huge hit with my kids and they are so flipping easy to make! Side Note: If you love Halloween, get excited, because I am in a major Halloween mood! 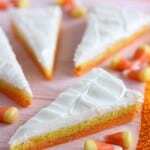 I’ve made four easy, fun halloween treats for you to whip up. These ghost pretzels are number one! The other three recipes will be up soon, so stay tuned! 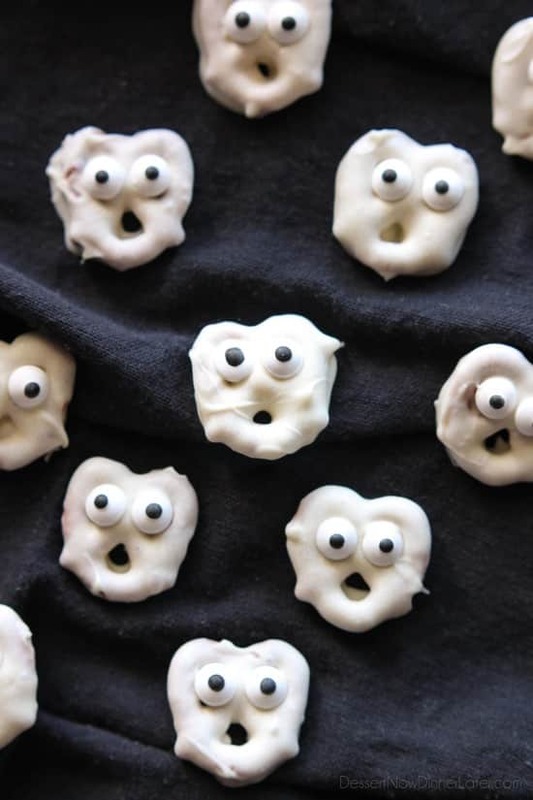 There are a few different ways you can coat these adorable ghost pretzels. You can do white chocolate (which is what I did), white candy melts, or white almond bark. I prefer white chocolate because it tastes the best. 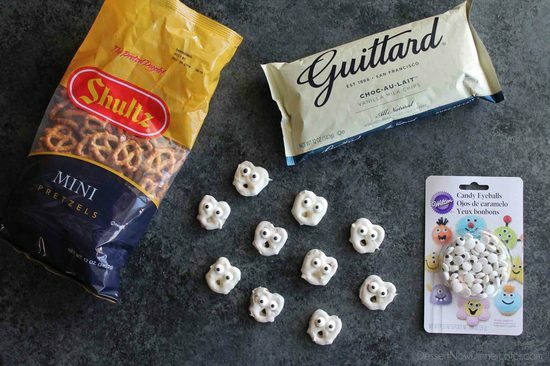 I always have a stash of my favorite Guittard chips on hand, so I just whipped out a bag of the vanilla milk chips and got to making these cute ghost pretzels. The candy eyes are like $2.50 a bag at Walmart or you can order them on Amazon. I also use a little bit of coconut oil to thin my chocolate for a better dipping consistency. Make sure to tap off any excess chocolate, at least in the bottom hole, so it looks like the ghost’s mouth is open — screaming! My daughter lit up when I showed her these ghost pretzels! They are as fun to eat as they are to look at, and you get major bonus mom points for making these things! 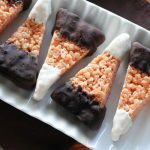 They are the perfect, easy treat for a Halloween party! White chocolate dipped pretzels are made into ghosts with candy eyes and a little bit of imagination. Line a baking sheet with wax paper, parchment paper, or a silicone baking mat. Set aside. Melt the white chocolate and coconut oil (or shortening) in a glass bowl in the microwave, for short 10-20 second bursts, until melted. Immediately dip pretzels, one at a time, in the bowl, using a fork to turn the pretzel over. Shake off excess chocolate from the pretzel with the fork. Be sure to shake the chocolate out of the bottom hole, so it looks like an open mouth -- screaming. Place chocolate dipped pretzels on the prepared baking sheet. Immediately press two eyeballs into the top two holes for eyes -- add a little extra chocolate if needed. Repeat with remaining pretzels. Work quickly. Heating the chocolate again only once, if needed. Allow pretzels to rest and harden. Place in freezer for 10 minutes to speed up the process. Peel pretzels off the baking sheet and enjoy! *Coconut Oil is considered a tree nut by the FDA. If making for a child's school, use shortening instead. These are so cute! How long do you think they’d last for when stored in an airtight container? Thinking about sending them in a package internationally and wondering if you think they’d keep? Hi Jess! I would say a week. They might get chalky looking speckles after a few days because of the coconut oil with the chocolate chips, so you could try using white candy melts (with no coconut oil) to help make them last a bit longer. Good luck! I make these every year for Christmas. Never thought about Halloween. These are so cute. Thank you for the idea !! Sending them to my son for Halloween. I’m so glad I could inspire a fun gift for your son! Happy Halloween! 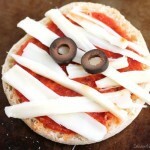 Gonna make for halloween potluck, make at home. and then it will be sitting in shade fo 2 hrs. do u think it will start to melt. any suggestions greatly appreciated. I guess that would depend on where you live and how hot it is. If they sit in the shade in 70 degree (Fahrenheit) weather or cooler, that’s probably fine. The chocolate hardens at room temperature, so anything close to that should be fine. Awesomely Cute! Just gotta make some of these scary critters and mail them to our grand children! Great Work! You’re such a fun grandma! I bet they will love that! You can use oil. I would go with vegetable or canola. Olive oil will probably have too strong of a taste. Hi Pam, Did you get a chance to watch the video I made? I typically shake off most of the chocolate, even in the eye holes. They only need a little chocolate to stick. Another trick is to use a finger to kind of scoop out the chocolate in the mouth hole before you set it on the wax paper, but it gets messy. 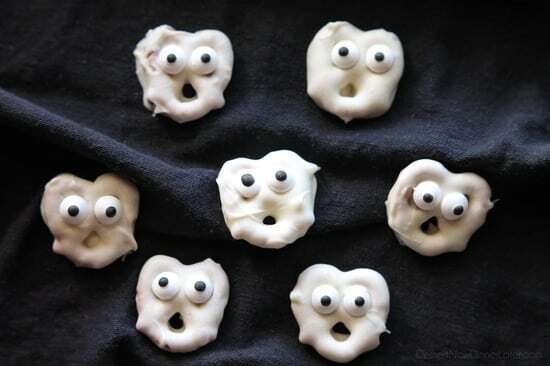 If you want another idea on how to make these, you could buy white chocolate covered pretzels, then melt some white chocolate, put it in a sandwich bag, cut off the corner and pipe the melted chocolate in the top two holes and add the candy eyes. Sorry you had a rough time. Hi- these look so cute! Can you used white morsels (Nestle)? Thanks! Absolutely. Most white morsels (chocolate chips) will work. It’s my daughter’s first year at college! She loves white chocolate covered pretzels.. can’t wait to make these and mail to her! Thanks for sharing! How fun! I hope she loves them! Good morning! My daughter and I had fun making this craft on the weekend. I featured it on my blog today with a link back to you. (Hoping this is proper etiquette) Have a wonderful day! Thanks for the inspiration!! Omg…so darn clever and cute. Was looking for an idea to top my cupcakes for our church bake sale…found it…yeah! Oh! That’s a great idea for these! Good luck with the bake sale! I made these for this year’s Halloween party and they were a hit! Ty for the recipe! That’s great news! Thanks for your comment Doree! I had a hard time with these last night. I used a bag of Wilton Candy Melts from Michael’s and it was so thick, it was very difficult to shake any off the pretzels. I also went to about 8 different stores looking for small pretzels and couldn’t find a single brand as small as the ones used in the video / tutorial above. If you could advise on brand it would be helpful! Lastly, I added the coconut oil to try to help liquify the chocolate more, and learned when I brought them into school today that it might be a problem for those with nut allergies since the FDA classifies coconut as a tree nut. A rocky first outing making these but I’m happy to give them another try sometime. That, or I’ll just stick candy eyes to Trader Joe’s yogurt covered pretzels! Hi Sarah, I’m so sorry you experienced problems. I noted in step 2 that you can use coconut oil or shortening to thin the chocolate. I’m sorry you didn’t know about coconut being considered a tree nut when making these for school treats. Our schools don’t allow homemade goodies, so I didn’t think to make a note of that in my recipe card. The brand of pretzels I used is Shultz (pictured in post), but Snyder’s also carries mini pretzels. You could also try regular pretzels and use bigger eye balls. Wilton for sure has at least two sizes to choose from. I highly recommend the Guittard (or Ghirardelli) white chocolate chips for dipping next time. Of course you could melt some chocolate and attach the eyeballs to the yogurt pretzels like you thought about. Good to know for next time, thanks! The smallest I could find was Brad’s Organic pretzels.